Have you tried the classic Magic Milk science experiment? It has been all over the internet and for good reason, it’s so cool! 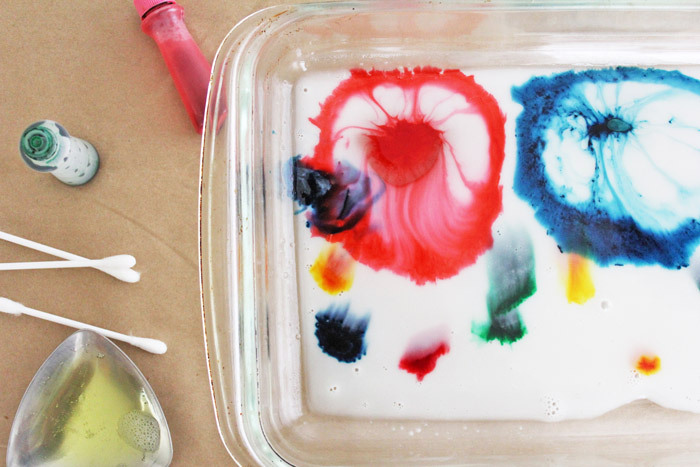 When you add a little bit of dish soap to milk and food coloring, the colors swirl around to form what I would deem very artistic and abstract paintings! For the science behind it scroll to the end of this post. Fill a plate or bowl with milk. 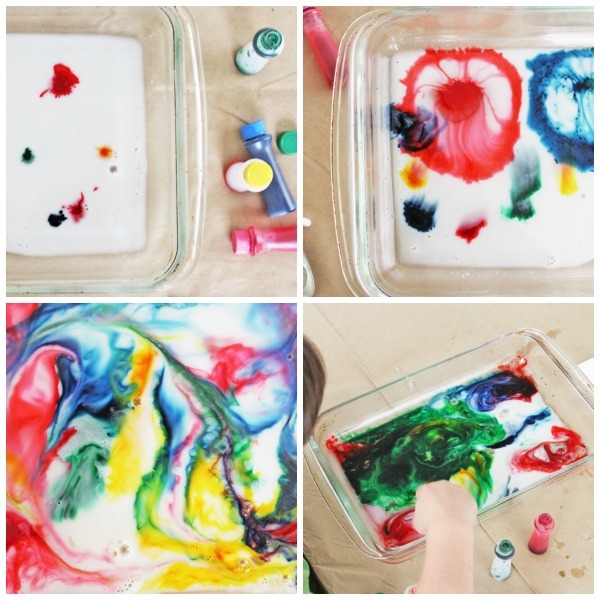 Drop in at least 2 drops of each of four colors of food coloring. The more variety of colors the cooler the painting. Generously dip the end of a q-tip in dish soap. 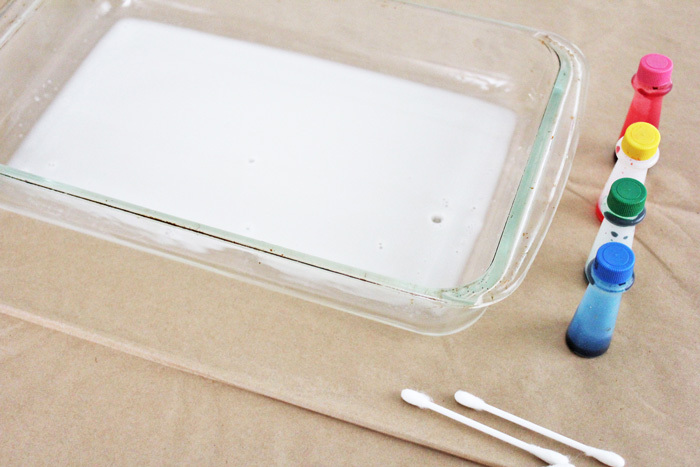 Now dip the q-tip into the milk next to a drop of color. The first thing that will happen is the color will burst as soon as the dish soap hits it. It’s a great effect but very short lived. Once there is a little dishsoap in the milk it no longer “bursts”. 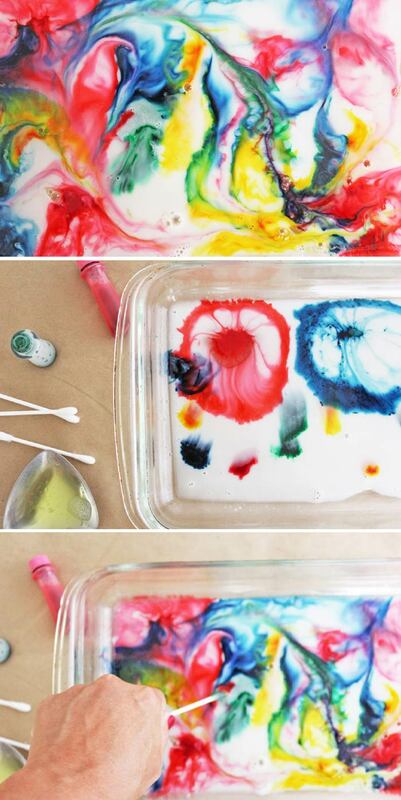 Gently swirl the q-tip through the different colors and you’ll see little rivers of color start to form. Continue until the colors begin to mix and become brown. Empty your plate/bowl and repeat. For a variation we premixed the milk and dish soap. You won’t have the color burst effect but it does seem to keep the colors separate a little longer. You don’t need that much milk! I vastly overestimated how much we would need. A gallon should go a long way. We experimented with both almond and cow’s milk. A fun experiment would be to compare the results with different types of milk: almond, cow, rice, coconut. Too much swishing and swirling and you’ll end up with brown muck fast. Of course kids don’t seem to care! The molecules in the dish soap are attracted to the fat molecules in the milk. 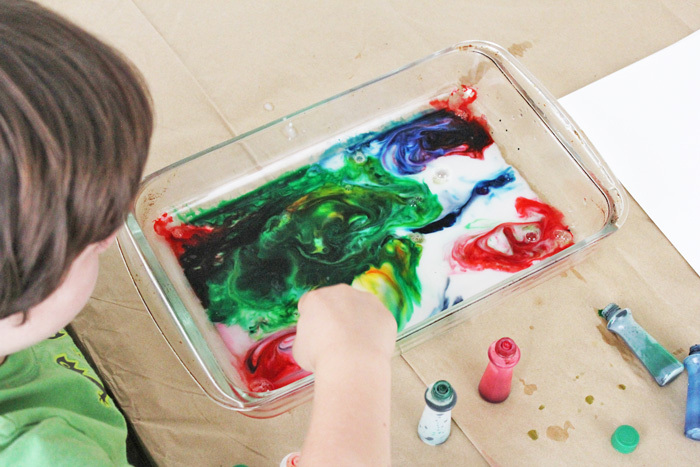 As soon as you introduce the soap to the milk/coloring mixture the molecules race around trying to bond. 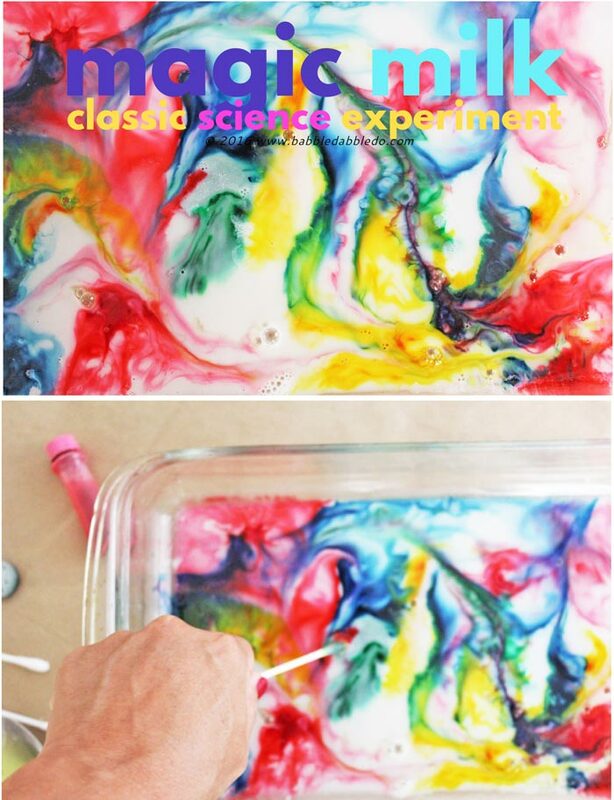 The food coloring gets pushed around in the process and appears to burst. Eventually the molecules all bond and the reaction stops. This is a good example of how detergents work, their molecules have two ends: one end is attracted to oils and the other to water. One end of detergent molecules attracts oils and dirt from clothes, dishes etc., and as they stick together they break the oil and dirt down into smaller, easy to remove pieces. 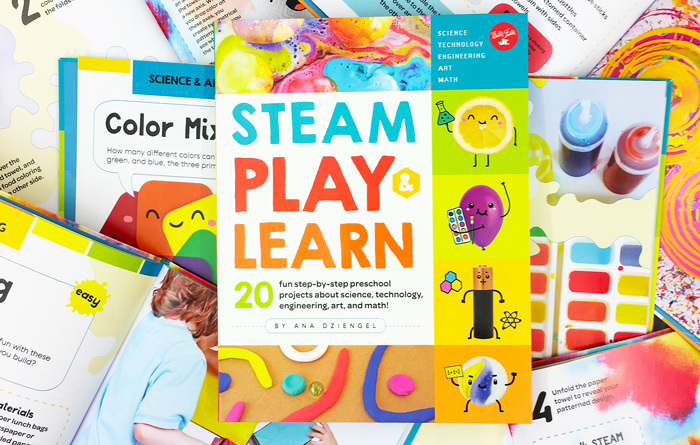 Turn this experiment into colorful paper! 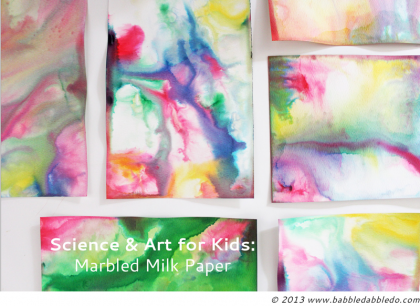 Did you know you can expand on this experiment by making Marbled Milk Paper? Thanks Michelle! So simple and fun! BTW your blog is lovely! 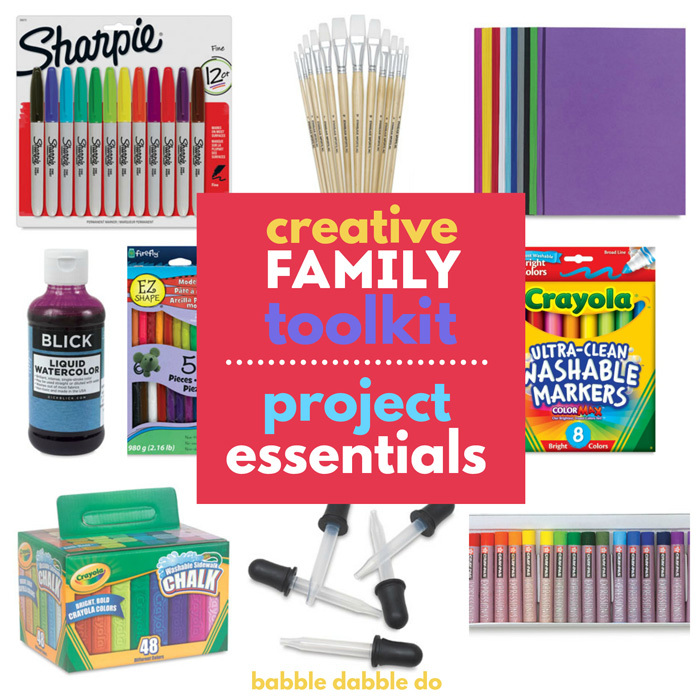 I particularly love that you have fast and easy projects; I’m trying to do something similar on my blog: quick, easy, simple projects using stuff you already have on hand. This is awesome my daughter and I are going to do this today! Thanks for stopping in Amanda! It’s a super fun and simple project. Enjoy! Thanks! I’m an art teacher. There’s so many meet ideas I got from your blog. Thanks! 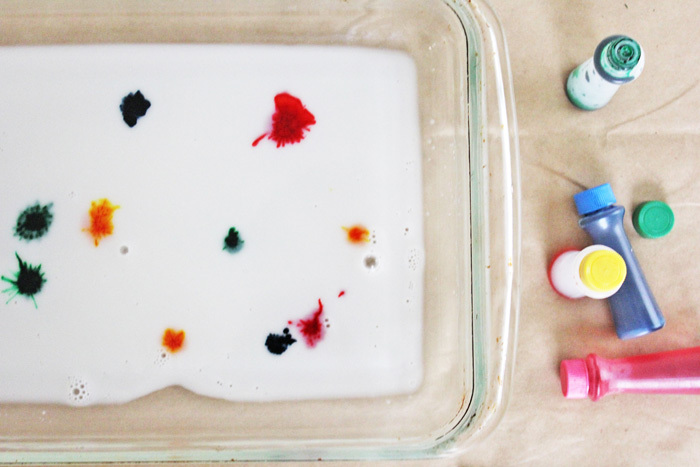 what type of paper did you use for the milk painting project? Did I miss something? I didn’t see directions for a little paper dog. I love this site. GREAT ideas Sorry if ? is dum! I can hardly wait to make the crystals. You know, Epsom salts have done ‘miracles’ ever since I knew of them! They were up front and most important in the “medicine cabinet” of my parents who had fifteen children, therefore many opportunities to use the salts for ‘injuries, localized infections and sore spots.’ Now I see they can add enormously to the decorations in my life as well as do almost magical “healing” Wish my Dad could see those! “What a Wonderful World!” Thank-you! I have tried this experiment out with my children today. I was really excited about it after seeing the lovely photo’s etc, however it was a bit of a flop. Tried it with Almond milk as suggested and semi skimmed cows milk, but when we put in the washing up liquid not much really happened. We changed the washing up liquid and got much better colour spread. However when it did the colours almost pretty much disappeared and trying to get paintings from them was so wishy washy. Are food colourings in the US very different to those in the UK, or do I just need to buy better colourings? I assumed that the liquid colourings from my local supermarket would be fine. I have also tried with gel colouring (which is the only thing that most stores stock) but this wasn’t particularly good either. I really want to make some lovely backings for Mother’s day cards etc but I am drawing a blank! Any help you could give would be great. Hi Rachel, I’m sorry to hear this! Gel food coloring will not work. Regular food coloring should work fine. You will need to make the prints right away, if you wait until the colors are mixed you will get muddy results. And make sure you are using watercolor paper. I tried the project using cardstock and regular paper and they just didn’t absorb the color well. I hope this helps and please keep me posted! Hello there, We used paste food colouring from cake shop, used to colour roll out icing, much better than the supermarket colours, which are useless for most things now as they have changed the formulas. Mix the colour paste with a little water to make a strong coloured liquid, we use this for colouring pasta too and play dough. Was looking for the science explanation (chemical reactions) to share with the students while doing this? I like teaching the science of a science based experiment. can the whole milk be used as a substitute for almond milk ? 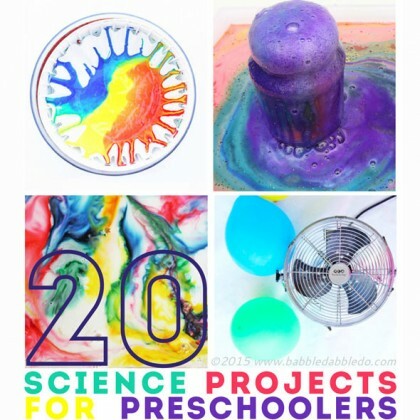 I love it when you add the science concepts involved, both at an adult level to refresh our memories or learn new, and at a level appropriate for young children. 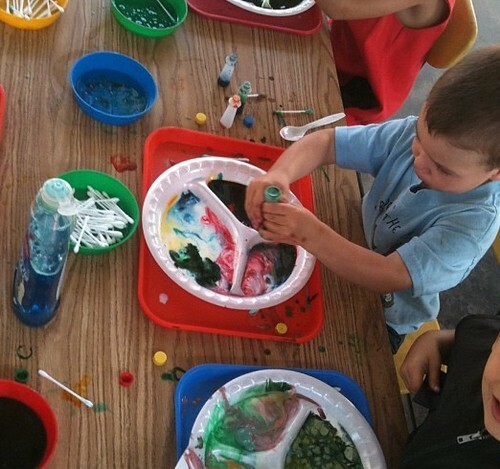 Exploring the properties of art materials engages children in art and science! I have tried the milk art 3 times with my grandchildren. We were very excited to watch the action of the colors in the milk but no much happened. 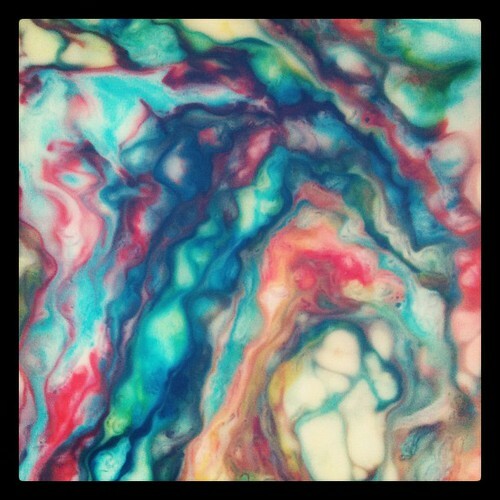 I used whole milk, food colors, and Dawn dish soap. But once I put the drops of soap in the colors spread a little and then nothing else happened, I have read the posts and people talk about all the movement of the colors but we didn’t get that result. Am I doing something wrong? Once the soap and fat molecules combine the reaction does stop. We like to swirl the milk using Q-tips after and watch the colors swirl. Messy. 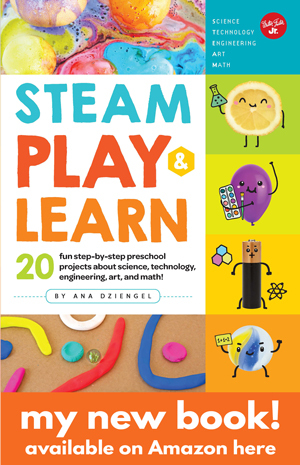 But I think my kids would love this activity. This looks like so much, and I love how it turns out. 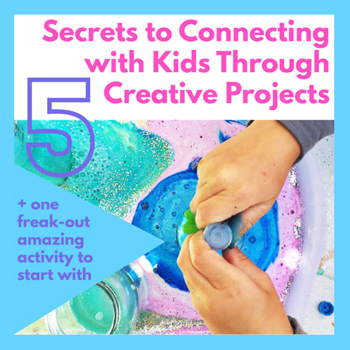 This would be a great project to take on with my four-year-old! Thanks so much for the idea!